I regard myself as geeky enough that I should be able to solve computer problems myself, or at least with the help of some self-service online searching. However, there are times when I simply can’t figure it out. I don’t know if I’m slowly getting dumber as I’m getting older, or if I’m just getting used to the ever-improving user experience in modern software (after all, I spend about 80% of my time in front of the computer using Firefox). Or maybe certain software is just particularly unhelpful? Whatever the reason, I obviously care a lot about user support, and use all the opportunities I can get to explore how other products/projects handle support. Also, I’m genuinely interested in user experience design, so I thought I should share this combined support/UX problem, not just as a self-centered way to ask for support, but because the subject genuinely interests me. My morning greeting from Colloquy the last 12 months or so. The problem I have is with the IRC client for Mac called Colloquy. 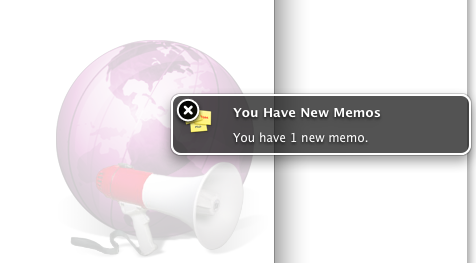 Every time I start the program, it pops up a notification saying “You have 1 new memo.” Clicking on this notification does nothing (other than closing the notification itself) and I have searched through all menu items trying to find a place where I can actually read this memo. So far I have failed, and today I thought I should do some searching to find the answer online. I started by searching in the Help menu and selected Colloquy Help, which took me to their Wiki documentation site. A search for “memo” there mostly resulted in articles about memory leaks, so I performed both generic and specific searches on Google instead. A search for “reading memos colloquy mac” finally revealed the solution: the notification about 1 new memo is actually coming from the message server of irc.mozilla.org, not from Colloquy itself! After some experiments, I finally figured our how to read it. The conclusion? IRC is not for mainstream users. Sorry for wasting your time by stating the obvious like this! This entry was posted in computers, mozilla and tagged colloquy, firefox, irc, open source, support, ux on 2009-06-10 by David Tenser. Ah, thank you so much! That one has been bothering me for month, but I always thougt it was the message for logging into the IRC server. I feel your pain, but very much think your conclusion here is wrong. It’s not that “IRC” is not for mainstream users, but rather that Colloquy goes too far (and yet not far enough) with trying to make it suitable for mainstream users. If you’d use chatzilla, or probably most any other IRC client, the message about having an unread memo would have been obviously sent to you by “memoserv”, and would appear the same as if a regular user would’ve just sent you a “private message”. There’s still a bit of a gap in expected action at that point, but as soon as you know about the existence of services and that you can message them for help, you could’ve done /msg memoserv help to find your way from there on. So if Colloquy wouldn’t have hidden from view that this notice about a “memo” was something created by memoserv, you probably would’ve figured it out long ago. And if they’d provided a full-featured interface to memoserv, not just notifying you, but also allowing you to read and manipulate those memos, there never would’ve been a problem. But because they only went halfway there, you got the worst of both worlds. Sender, very insightful response. I agree that if Colloquy hadn’t used this fancy notification that is completely separated from the source of the action, I would have had a much greater chance of reading this memo when it was actually relevant to me 12 months ago. Colloquy’s attempt to be user friendly is simply half-assed. Thanks for your comment! Services support (MemoServ, NickServ, ChanServ) isn’t the easiest thing to integrated into an IRC client because it’s not part of the IRC protocol. An IRC server doesn’t come with services usually, and you have to get a separate IRC services server program to run. Many servers use similar services but they may have slightly different feature sets, be slightly different revisions of the same services, or may even have different sets of services altogether. Furthermore with most services you can rename or deactivate any of the services. Many servers activate /ns, /nickserv, /cs, /chanserv, /ms, and /memoserv shortcut commands while others require you to /msg the services. Example. Anope is the most popular services, but there are a few others too. GameSurge uses the most unusual services set I’ve seen, where there is no NickServ and instead uses “AuthServ”, and user accounts are NOT tied to individual nicks but to a unique AuthServ username. So you can authenticate using a user name NOT tied to your nick to get your services benefits. If an IRC client tries to integrate with Anope NickServ it is going to totally not work on GameSurge (GameSurge bounces back an error telling you to use AuthServ instead). I’m guessing Colloquy has something like this. I’m guessing Colloquy sees the MemoServ notice when you log on to NickServ informing you of your memo, but of course there is no guarantee that /msg MemoServ read 1 will work. Maybe someone somewhere has mad a MemoServ with a web interface for managing memos and it only notifies you about them over IRC, and has no commands itself. Colloquy’s devs may have chose to only integrate with MemoServ as far as parsing messages it sends that Colloquy understands. TLDR version: IRC protocol does not extend to services, where, AFAIK, there is no standard and thus no easy way to integrate them with chat clients. In my experience, MemoServ sends you a good three lines explaining how to read your memo. I’m not sure if that server has a very terse MemoServ or if Colloquy isn’t bothering to Growl the whole message. I used Colloquy for a while, and this sort of thing is in fact exactly why I stopped using it. I’ve been using IRC pretty much since I first had an Internet connection, and I was still regularly lost by Colloquy’s attempts to hide any of the “complicated” internals of IRC (like messages from Services?!) from me. IRC just doesn’t work like that. My conclusion: MemoServ is not for mainstream IRC users. Can we turn it off on irc.mozilla.org, and make Neil use email instead? Thank you so much, David! This has been bothering me for months! Conversely, I really like MemoServ. Sometimes jX will be offline, battling his router, and he’ll want me to send him a link that he thinks will be interesting. I use MemoServ because direct messaging him on Twitter would require me to tinyurl the link as well, and we both understand how to use MemoServ. My client shows me the message, the full one, “you have a message, do this to get it.” It’s actually really useful, though most people I want to talk to on moz irc I can just email if I miss them. I do find it interesting how many people are blaming IRC and memoserv for the problem when I would bet you all use colloquy. Good reminder that when people have bad experiences they tend to paint things with a much wider brush than when it’s positive (even when they should know better 😉 ). It’s not really so much that Colloquy is displaying that on purpose, but that it’s displaying that via Growl or its own internal notification to let you know that there is such a notice. MemoServ is not that popular and well, nobody’s ever told us about this particular issue either. So it was the perfect storm of nobody doing anything (until now) about this 😉 Please let us know about these issues! File bugs in trac or just email us at support@colloquy.info. Anyway, Dan does hit the spot with his explanation of how services work with regard to IRC. We still have to address individual NickServ issues with identification per network/services packages, let alone memos and similar.